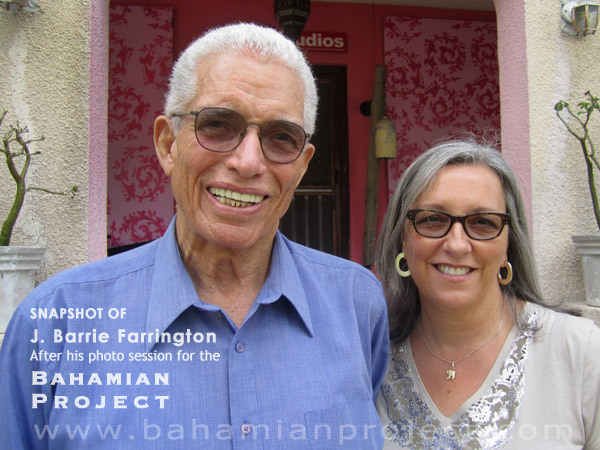 J. Barrie Farrington pictured with his wife, Susan, following his studio-portrait session for the Bahamian Project. The final portrait images will be unveiled at the Exhibition Opening at the National Art Gallery of The Bahamas on July 11, 2013. He grew up in a modest home on Hawkin’s Hill. His first job was in 1954 with a public accountant. 1971 was the start of his career in the hotel industry, a career from which he retired in January 2013 after more than 40 years, leaving behind an indistinguishable imprint in the history of The Bahamas. The veteran hotelier has been called a tourism giant and he has played an important role in empowering the tourism industry. He is highly regarded as someone with integrity and dedication and has been lauded for his contributions to the Bahamianisation of the senior management of the international hotels. While in our studio, he recounted the early days in the making of Atlantis with Sol Kerzner and his son Butch. He joked with us about making history in the early days of Bahamian politics too. He told us he was both the youngest Bahamian to be appointed to the Senate and also the one to have the shortest term, after the House of Assembly was dissolved for the general election in 1968. He has served as chairman on many boards and committees, including Bahamasair and the Bahamas Electricity Corporation.